Your first aid kit will never be complete without the best baby thermometer. For most parents, first fevers are so scary especially if you’re first time parents or have not experienced anything close with any of your kids. This is why it’s highly advisable to always have a baby thermometer close by because you cannot tell when the fever will strike and you need to be sure of how bad it is even before calling your doctor for proper advice. If the fever is above 100.4 degrees Fahrenheit just know that it’s serious and you need to take urgent measures and especially if your baby is three months old and below. The “touch test” is not precise nor reliable and that’s why every parent should include a baby thermometer in their baby’s shopping list. We have carefully selected and reviewed the top 10 best baby thermometers to help you feel more confident when taking care of your baby. We have also looked at the various types of baby thermometers as well as a baby thermometer buying guide to help you make an informed choice. How safe is the thermometer? Rectal baby thermometers: these are a little bit uncomfortable, but they give the most accurate temperature measurements and are the best for infants. Note: when buying a rectal thermometer, ensure that it has a wide base and a flexible tip to ensure that you’re not inserting it too far as that can be dangerous. For 3 months and younger. Oral thermometers: these are also accurate and also easy and safe to use. All you do is place it under your baby’s tongue and wait for the readings. They are the best thermometers for kids above 4 years old because they can remain still. Infrared/Forehead/temporal artery thermometers: these are the most expensive baby thermometers because they use infrared technology to measure the baby’s temporal artery temperature on the forehead. They are also very accurate and the most convenient and safest thermometers because you won’t need to touch your baby. They are ideal for use by kids of any age. Axillary (armpit) thermometer: these are the least accurate and they should only be used when you don’t have any other type. Most use them, but they are not so reliable. Ear canal thermometers: These are easy to use and minimally invasive. They can be used on kids over 12 months old because their ear canals are not too narrow. However, to get accurate readings, they must be placed in the right position in the ear. Pacifier thermometers: these are the best for young babies, but they are not very reliable as the readings are not very accurate. Just as the armpit thermometers, these should only be used when there is no another option. Glass thermometers: The first type of baby thermometers to avoid is the glass thermometers since they not only contain mercury, which is highly poisonous but also break easily hence posing a great danger to your little one. They might get the job done, but they are highly poisonous and old-fashioned. Pacifier thermometers: The most annoying thing about pacifier thermometers is that they a long time to measure the baby’s temperature (3-5 minutes). Again, they are not very accurate, and some might pose a choking hazard. Oral thermometers: these are the best thermometers for older kids (four year olds and above) because they can hold them well in the mouth for accurate results. Baby thermometer hygiene: Remember, your baby thermometer can reintroduce the same harmful germs to your baby after they have recovered. Thus, it is important to keep the thermometers clean all the time and stick to just one use if you buy a multiuse thermometer, i.e. if you choose rectal, stick to that at all times to prevent bacteria transfer. Instructions: you may have used various baby thermometers in the past, but it’s advisable to always read the instructions if you buy a new one to ensure that you’re getting accurate measurements. Why we like it: The Braun ThermoScan7 thermometer features an adjustable age technology to allow you to measure and monitor temperatures for different ages accurately. It has a pre-heated tip that is not only comfortable for ear use but also ensures accurate measurement. It keeps a record of up to 9 readings to allow you to monitor the temperature progression. The Braun ThermoScan7 gives you a thermometer to use with your entire family thanks to the age precision technology. The ExacTemp technology makes it easy for you to place the thermometer in the ear for correct measurement. The color-coded fever alert for different ages alerts you when your little one’s temperature is alarming. It comes with a pre-heated tip to ensure you get the correct measurement. Its memory records up to nine previous measurements to allow you to monitor your little one’s fever progression. It allows you to choose between Celsius and Fahrenheit based on your preference. The Braun ThermoScan7 thermometer is fast and easy to use to allow you to check the temperature even for stubborn infants quickly. The color-coded display gives you an easy time to read the thermometer and the backlit display ensures you can take the measurements at night. It comes with a case for easy and clean storing and also includes 21 pieces of probe covers to allow safe sharing without spreading infection from one individual to another. The extra battery is convenient so you won’t have to worry when your battery runs out. 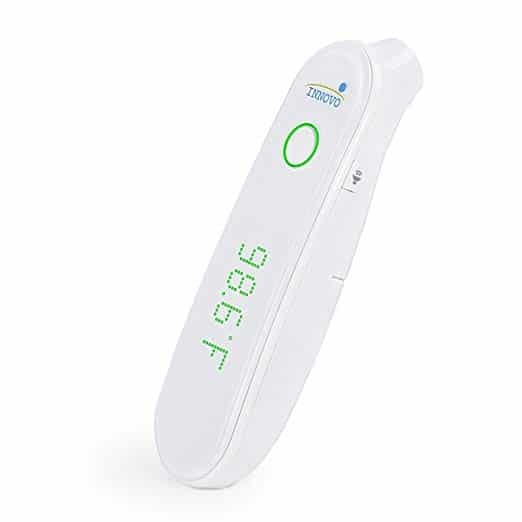 The ThermoScan7 thermometer could be your best pick if you are looking for a reliable thermometer that allows you to switch between different ages and for accurate fever tracking. It is quick and easy to use thus perfect for young infants. Its excellent accuracy and consistency make it the best ear thermometer. Why we like it: The iProven DMT489 baby forehead thermometer offers you the option of using it on the forehead or as an ear thermometer. It is standardized for medical use to guarantee correct readings at all time with great speed. We like that it is easy to use and it keeps a memory of up to last 20 readings. It also has a loud beep to notify you when it’s done taking your baby’s temperature. 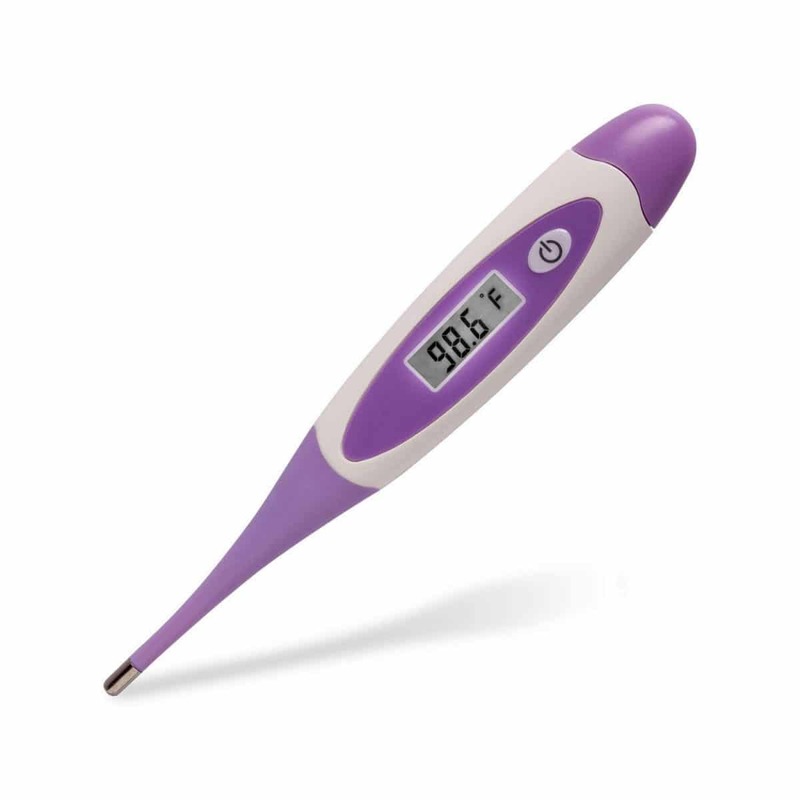 The iProven DMT489 baby thermometer is designed to be used both on the forehead and in the ear. The forehead mode is a quick scan method that can be used on individuals of all ages thus perfect if you need a thermometer for your entire family. The ear mode is a more convenient method since it will give you a more accurate measurement. You can only use the ear mode on babies who are 6 months of age and older. Nothing is as reassuring as a thermometer that can give accurate results and fast. With iProven DMT489 baby thermometer, you can always be sure of precise results. The thermometer has been clinically tested to ensure that you get consistent results no matter how many times you take your baby’s temperature. The back-lit display ensures that you can check your child’s temperature during the day or night. 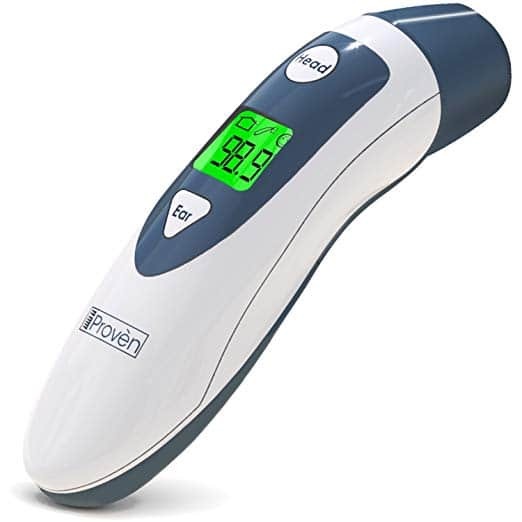 We all like an easy time and this thermometer from iProven ensures you get that. It features two buttons; one for forehead mode and the other for ear mode to guarantee ease of operation. It also features a fever indicator which lights up in green or red to alert you on when you should be concerned about your baby’s temperature. You will like that it keeps a memory of up to 20 readings that you can use to track your child’s fever. If you are looking for a thermometer fit for all ages, this could make an excellent option for you. It is fast and accurate. It is also easy to use and offers dual operation mode. It alerts you when it’s done checking the temperature and keeps track of up to 20 measurements making it the best forehead baby thermometer. Why we like it: The Innovo FR201 gives you results within a few seconds. The non-contact mode allows you to use the thermometer with your entire family safely. It allows you to quickly switch from forehead mode to object mode and stores up to 20 readings. We like that you can quickly switch from Fahrenheit to Celsius and also switch between beeping to silent mode. The Innovo FR201 thermometer allows you to use it as a forehead thermometer or an object thermometer to check on your baby’s bottle temperature or bath temperature. It has been clinically tested to ensure accurate and consistent readings. It keeps a record of up to 20 previous reading making it easy for you to keep track of your family’s temperature. The thermometer allows you to quickly switch between Fahrenheit and Celsius so you can pick the mode you are most comfortable with. 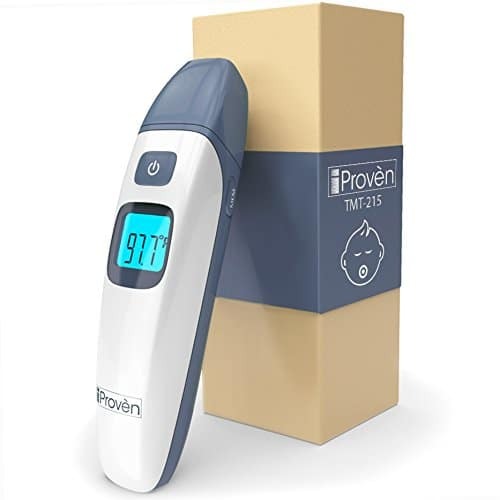 The Innovo FR201 thermometer allows you to take the temperature 2 inches away from the forehead meaning you can use it on different people in your family without worrying about spreading illness. It displays reading within one second to allow you to use it comfortably on young children. It features a single button to make it easy for you to operate. It beeps when done checking the temperature, and it allows you to switch to silent mode for use when the baby is sleeping. It also alerts you when your baby’s temperature is too high and switches off after 10 minutes thus saves on battery. The protective cover allows you to store the thermometer safely and the extra batteries ensure you are always covered in case your current battery runs out. This thermometer makes a perfect choice for your entire family. It is safe to share and also easy to use on young kids. It also makes a great selection if you are looking for a thermometer that offers more than one use. 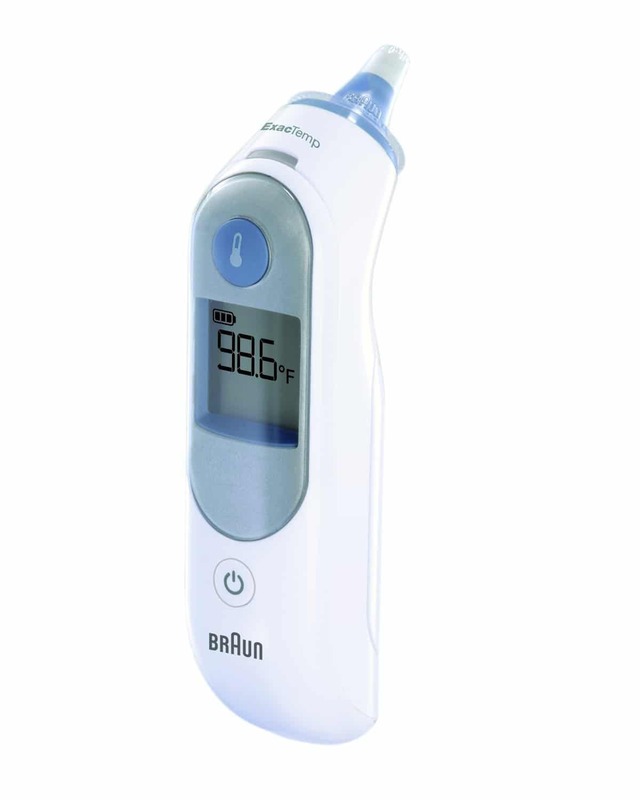 Why we like it: The Braun ThermoScan5 digital ear thermometer is easy to use, fast and offers accurate measurements. It comes with 21 disposable lens filters to allow safe sharing thus great to use with anyone in your family. It also recalls the last temperature that was taken. The Braun ThermoScan5 is an ear thermometer meaning you will have an accurate measurement at all times. It features a pre-warmed tip to ensure accurate and consistent measurements. It has a positioning system that guarantees you correct placing in the ear for a precise reading. The thermometer keeps a record of the most previous measurement so you can easily track the temperatures. The Braun ThermoScan5 ear thermometer lights up as well beeps to alert you when it is done measuring the temperature. If you would like to use the thermometer between multiple users in your home, it comes with disposable lens filters to enable you to do so. The lens filter prevents infection from being spread from one child to another and also keeps the thermometer from wax residues which could lead to inaccurate readings. It is fast to enable you to take your child’s temperature quickly and is also easy to use with large buttons. We also like that it is comfortable to the ear and easy to hold. It gives you the freedom to select between Fahrenheit and Celsius. The Braun ThermoScan5 digital ear thermometer makes the best choice if you are looking for an ear thermometer for your family. It is fast and gentle thus suitable for infants since they become restless quite fast. It is fast making it a reliable thermometer for day to day use. Why we like it: The Dr. Madre digital thermometer uses a non-contact mode and gives accurate and consistent readings. You can either read it or let it talk to you in either English or Spanish. The backlit display ensures you can use it at night and it keeps a record of up to 12 previous readings. Its display screen is big to give you an easy time when reading the measurements. The Dr. Madre digital thermometer is non-contact allowing you to easily take temperatures even for stubborn young babies or when they are sleeping. It allows you to either read the results from the display or let the instrument read it to you in either English or Spanish. The thermometer allows you to track up to 12 previous readings making it easy for you to monitor your little one’s fever. The thermometer is fast and you will have your results in less than a second. It has a backlit display to allow you to check your baby’s temperature at any time you wish. The display screen is also big for easy reading. The included user manual will guide you on how to use the thermometer easily. You can easily switch it from Fahrenheit to Celsius and it beeps once it is done checking the temperature. It also offers a silent mode that enables you to switch off the speaking mode when your child is sleeping. You will love the included storage case that allows you to store the thermometer safely. The Dr. Madre digital thermometer makes a perfect selection if you are looking for a thermometer for your young infant. It is non-contact and fast to allow you to take the temperature quickly. It is also great for individuals with eyesight problems thanks to the large display screen and the English or Spanish speaking options. Why we like it: The Ankovo digital thermometer offers two modes of taking the temperature to allow you to use it for individuals of all ages. It is fast, accurate and keeps a record of up to 20 previous readings to make it easy for you to track fever progression in your child. It is easy to use and has a beep once it is done taking the temperature. 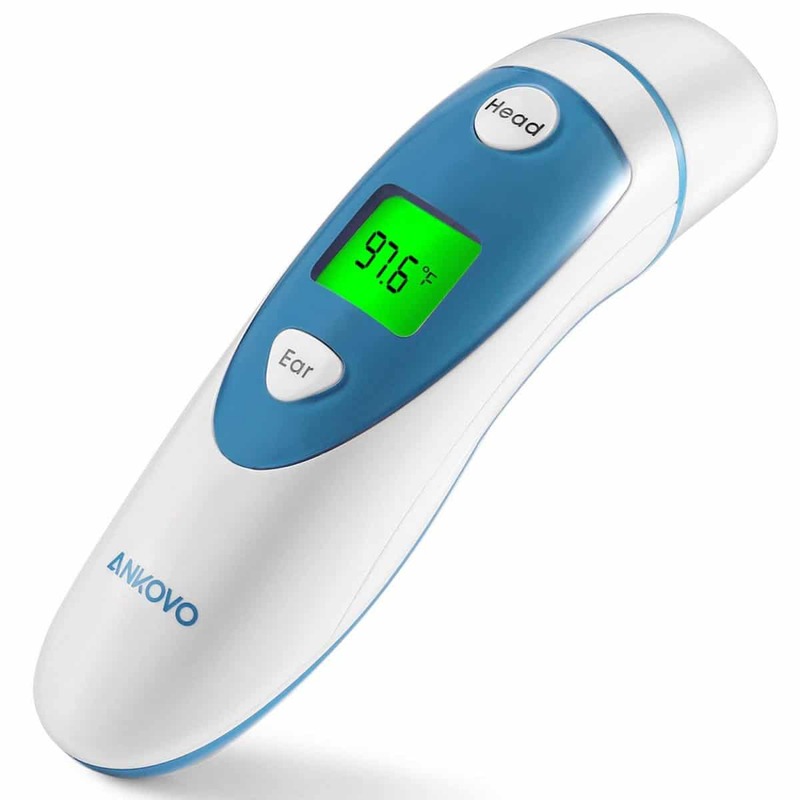 The Ankovo digital thermometer is reliable and allows you to either use the forehead function which is suitable for all ages or the ear mode to use on children above 3 years old. It keeps a record of up to 20 previous readings to make it easy for you to keep track of the body temperature. It is fast and will give you the result within one second. The infrared sensor also guarantees you accurate measurements at all times. It does not have mercury thus safe for your child. It comes with only two operation buttons therefore easy to use. It warns you when your baby’s temperature is too high so you can take necessary action. It has a beeping sound that alerts you once the thermometer is done checking the temperature. The large display will give you an easy time to read your baby’s temperature. The display also allows you to use the thermometer at night. It offers you the options to select between Celsius and Fahrenheit so you can easily choose the mode you are comfortable with. It features an indicator that warns you when the battery is low, so you won’t have to worry about being caught unawares. The cap and carrying case ensure safe and clean storage. If you are looking for an easy to use yet accurate baby thermometer, this makes a good choice. It offers two modes of operation thus great if you want a multipurpose thermometer. It is safe and fast therefore suitable for children and can also be used on individuals of all ages making it perfect for family use. Why we like it: The iProven baby forehead and ear thermometer can also be used as a room or as your baby’s bottle thermometer. It has undergone testing to guarantee accurate and consistent measurements. The thermometer lights up to warn you if your baby has a fever and features backlit light to allow you to use it at night. We like that it beeps to alert you when it is done with the measuring and the beeping can be switched off if you want. This thermometer makes work easier for you due to its multiple functions. You can use it to take your baby’s temperature through the ears or forehead, or you can use it to measure the nursery’s temperature or your baby’s bottle temperature. You will not have to worry about inconsistency in readings since the thermometer has undergone testing to ensure all readings are accurate and fixed. If your baby’s temperature is alarming, the display lights up either green or red to alert you. It allows you to switch between Celsius and Fahrenheit so you can always select what you are comfortable with. The iProven forehead and ear thermometer has a beeping sound to let you know once it is done measuring your baby’s temperature. You will love that the sound can be muted to allow you to check your little one’s temperature without the sound waking them up. The non-contact thermometer is convenient on your baby since they won’t notice you taking their temperatures. It comes with a storage bag so you can keep the thermometer clean at all times. If you are looking for a thermometer for multiple uses in your home, this 3-in-1 thermometer is your best bet. It allows you to easily check on your baby temperature, room temperature as well as their bath. The non-contact mode also makes it great for infants who can’t remain still when checking their temperature. You can use it on infants and adults making it a perfect selection for your family. 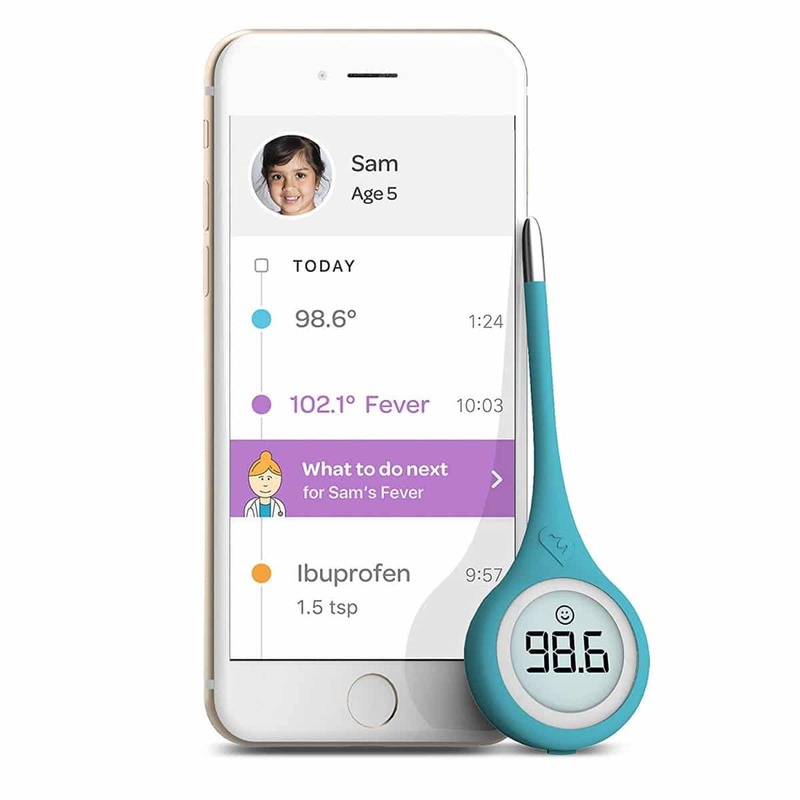 Why we like it: The Kinsa QuickCare smart thermometer allows you to connect it to your smartphone for easy tracking of data and free medical advice. It is fast and accurate. You can use it as a rectal thermometer, underarm or oral on individuals of all ages. We love the Sesame Street mode that soothes your sick baby. The Kinsa QuickCare thermometer has been designed to be used as a rectal thermometer, oral or underarm and can be used on individuals of all ages. It allows you to connect to your android phone using Bluetooth. It offers a free App that guides you on what to do, tracks measurements and gives you medical advice. You can log in your little one’s symptoms into the App and it will guide you on taking care of your baby. You can also use it as an alarm to alert you when you should be giving your baby medicines. The App also keeps a record of up to 50 previous reading thus perfect for tracking fever progression. The Kinsa QuickCare thermometer gives you results within 8 seconds giving you an easy time when checking young baby’s temperature. It has been clinically tested to guarantee you accurate readings that you can rely on. The App keeps individual’s profiles separately making it easy for you to use on different members of your family. Your child will love the Sesame Street design in the App that soothes them when they are sick. If you are looking for a thermometer that will make it easy for you to take care of your little one, then this could be the best choice. It comes with an easy to use smartphone App that not only advises you on what to do with your child but also alerts you on when to administer their dose. The App also makes it great for your entire family. Why we like it: The Purple Safety baby thermometer is a digital thermometer that gives an accurate reading in 30 seconds. You can use it as a rectal thermometer, under the tongue or the armpit. It is easy to use and read thanks to the large display. It is easy to clean and comes with a flexible tip thus comfortable to use as a rectal thermometer. The Purple Safety baby thermometer offers three modes of operation. It is designed with a flexible tip so that you can safely use it as a rectal thermometer. You can also use it under your child’s tongue or armpit. It comes with a fever indicator that beeps to warn you when your little one’s temperature is too high. The Purple Safety digital thermometer gives you results in 30 minutes to guarantee you quick measuring. Its accuracy and clear display ensure correct and efficient measurement. It comes with an extra battery, so you don’t have to worry about buying a new one once the current one runs out. It is waterproof allowing you to easily clean the thermometer to safely use among your children without risking spreading infections. The included beeper will inform you once the thermometer is done checking the temperature. It automatically switches off after 10 minutes and comes with a hard case cover that you can use when you store it away. The manufacturer offers to give all your money back in case the thermometer does not meet your expectation. The Purple Safety baby thermometer is the best thermometer when working within a budget. It is accurate, easy to read and use and also easy to clean thus safe for your baby making it an excellent selection given its price. It also allows you to clean and sanitize it thus perfect if you have more than one toddlers. Why we like it: The SANPU oral thermometer also allows you to use it as an armpit thermometer or rectal. It gives you results within 8 seconds and has a beeping sound once it is done taking the temperature. The big size display and backlight assure quick reading at all times. The red light that warns you when your baby’s temperature is too high makes it easy for you to detect fever. The SANPU digital thermometer allows you to use in different ways; rectal, armpit or orally. The waterproof design makes it easy to clean for safe usage. The flexible tip is gently to ensure your baby’s comfort when used as a rectal thermometer. The single on and off button makes it easy to operate. The microchip tip provides accurate results. It automatically switches off after about 30 minutes. 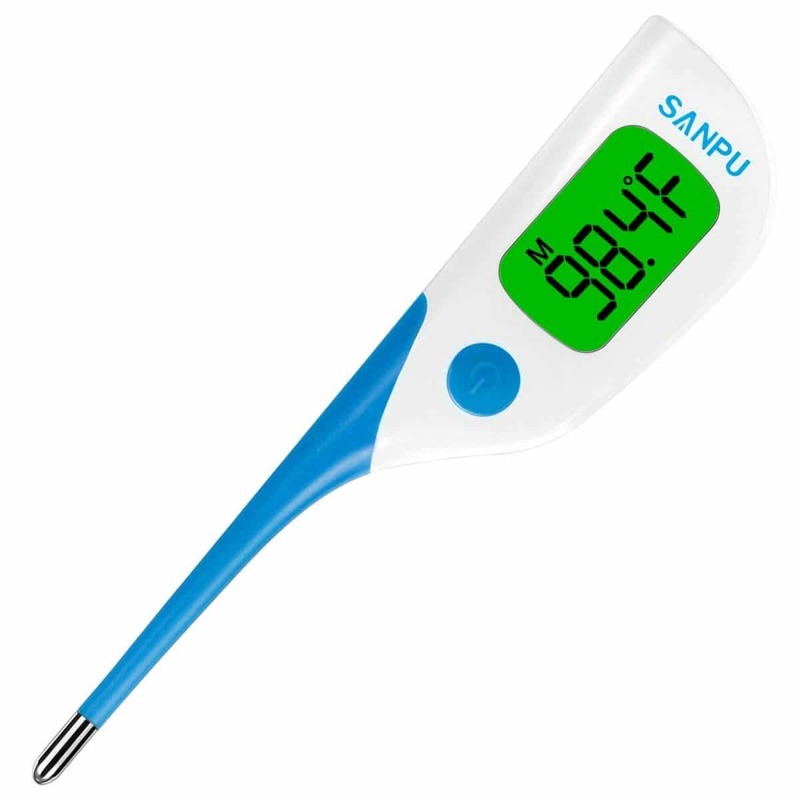 The SANPU digital thermometer has a beeping sound to alert you when it is done taking the temperature. The convenient display allows you to read the results with ease and can also be read at night. It has an alarm that warns you when your baby’s temperature is too high so you can take necessary action. The thermometer allows you to easily switch between Fahrenheit and Celsius so you can select the mode that works best for you. It keeps a record of the last reading and is easy to clean thus suitable for your entire family. The protective case ensures safe and clean storage. It comes with a 1-year warranty and 30 days money back guarantee so you won’t have to worry when something goes wrong with the thermometer or if you don’t like it. If you are looking for a cost-effective yet reliable thermometer, this could be a perfect choice. Its simplicity and quick results make it great for use on young babies. The flexible tip makes it comfortable for rectal use. It is easy to clean allowing you to use it on more than one baby safely. You might be able to tell that the temperature changes in your baby by feeling the warmth on their forehead, but you cannot know the extent unless you use a very accurate thermometer. For babies, even a slight change in their body temperature could be an indication of a serious infection or illness. Thus, it’s highly advisable to have a reliable baby thermometer at all times to help you know when you need to rush or call your pediatrician. 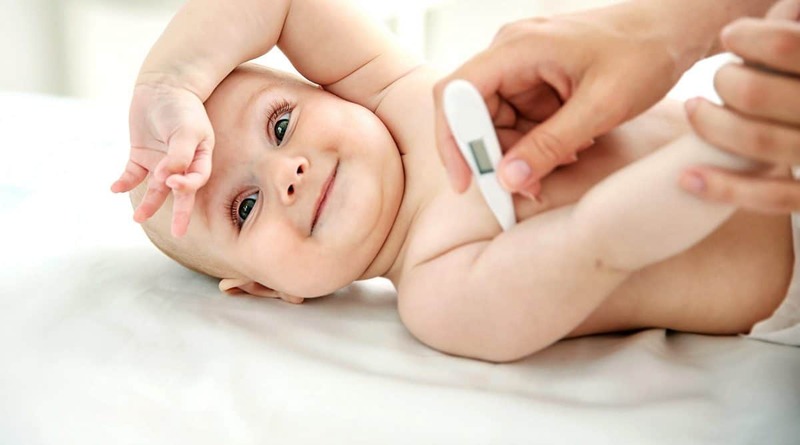 How do you choose the best thermometer for your baby? What factors do you consider when buying one? As we noted above, some thermometers won’t work for some kids because they might not be age appropriate. Oral thermometer for example requires your baby to remain still and have it in their mouth for a few minutes to get accurate readings. As such, they can only be used by older kids who can understand what you’re telling them. On the other hand, rectal thermometers are appropriate for kids of any age because they are very accurate and easy to use. But, they are not recommended for use on kids older than five years because they might be invasive at this age. It’s good to note that even the slightest change in your baby’s body temperature could mean a serious issue. Any incorrect reading can easily mislead you and make you relax only for the condition to get worse. You don’t want to hurt your baby in the process of checking their body temperature. Hence, ensure that the thermometer’s design is safe for your baby. This will mostly apply to the rectal, oral and ear thermometers since they require some form of insertion in your baby to get the readings. Also, do some research on how to use them before using it on your baby to ensure that you’re following the right procedure. Note: Do not take your baby’s temperature immediately after a hot bath because hot raises their temperature for around one hour. Again, when using a multipurpose thermometer, use it for just one area for hygiene purposes. And, you can consult your doctor about the type of thermometer to get for your baby and also how to use it if you haven’t used one before. Again, know when to see your doctor based on your baby’s temperature readings and also any helpful tips to get the temperatures down before reaching the doctor/hospital. Most baby thermometer types are very affordable and you will easily find one that fits your budget. It can be so annoying when you’re all panicky and running to your doctor only for them to tell you that your baby’s temperature is fine and they are not ill. To avoid this, do thorough research before buying one to ensure that you’re getting accurate readings all the time. Our top pick baby thermometer is the Braun ThermoScan7 IRT6520 Thermometer and it won’t disappoint you. Given that babies can be hard to keep still and especially when they are unwell, you’d rather go for a thermometer that will give you a quick readout while also remaining accurate. Infrared thermometers are the fastest, but also a bit expensive. If you decide to go with the inexpensive digital stick baby thermometer, we would advice you to get two for different parts just to compare the readings. However, remember to label them with a permanent marker to ensure that each is used for the designated part always. The best thermometer should have a large display, or better, backlit, to make it easier to read. Some thermometer model will have a display or tone to alert you when the temperature is higher than normal. We have reviewed the best baby thermometers and from our list you’re guaranteed to get one that will make you and your baby happy. Our thermometer buying guide is also well detailed to help you make an informed choice and we will be happy to hear how you like what you choose.